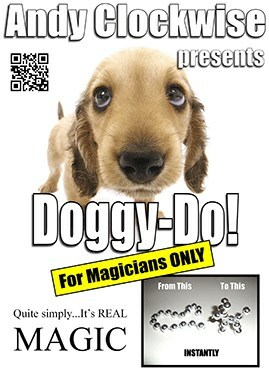 If you like easy to perform Magic that gets great reactions, Doggy-Do! Is one for you. From the creative mind of Andy Clockwise who brought you Cheque Mate comes an effect so easy to perform you'll be doing Doggy-Do! immediately. A length of beads openly displayed in your palm up hand instantly transform themselves into the shape of a small dog. All that you need to perform this marvel is included in this pack INCLUDING an instructional DVD. Instantly reset to perform again and again, and again . . .